The development, originally named ‘The Cultural Tourism City’ was initiated by the Wanda Group, the same company that built the world’s largest indoor snow centre (by snow area) in Harbin, Northeast China, which opened in 2017. 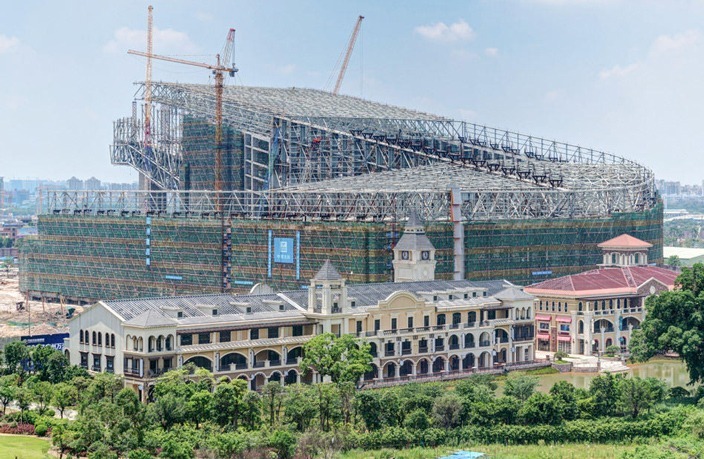 Wanda has since been restructuring and has brought in other operators for its leisure ventures at various time so exactly who is building and running the new centre isn’t quite clear, but the project is nearing completion anyway. 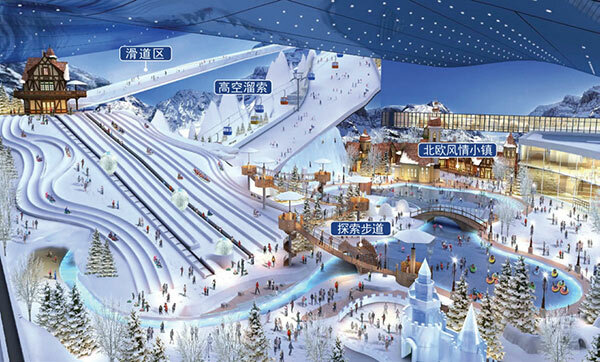 The Guangzhou centre will have four separate indoor ski runs of 328m, 230m, 243m and 78 metres in length. However in an unusual design feature it is reported that the 328m and 78 metre slopes can be combined in one run via a flat 50 metre link area to create a 460 metre long descent. This places it in 5th place behind The Alpincentre in Germany (640m), Ski Amneville in France (620m), SnowWorld Landgraaf in the Netherlands (520m) and Dalian Wanda City in Harbin, China (500m). 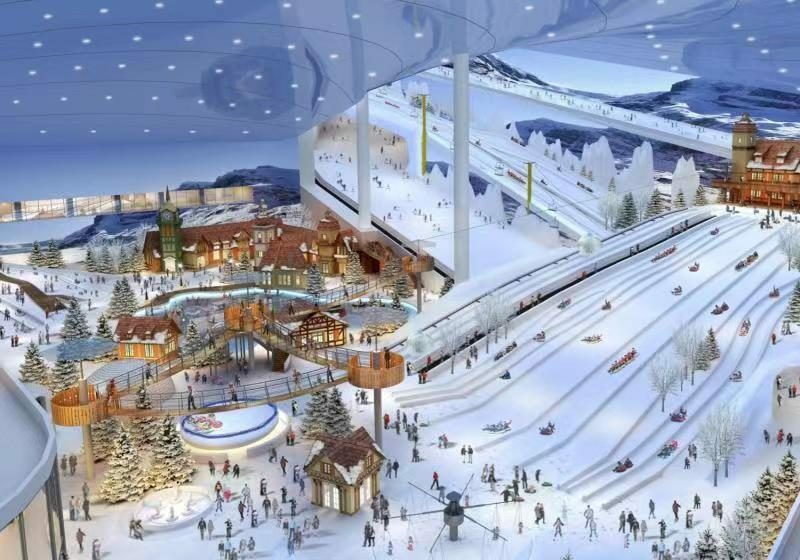 However two slopes currently under construction And due to open next year in 2020 should be longer, Sno in Norway (505m) and Meydan One in Dubai (between 750 and 1.2m according to various reports). The 50 billion RMB Guangzhou development covers 75,000sqm and the snow slopes 56,000sqm (the second biggest indoor snow area in the world after Harbin). Located 18km from Guangzhou airport it is expected to attract 20 million visitors per year. 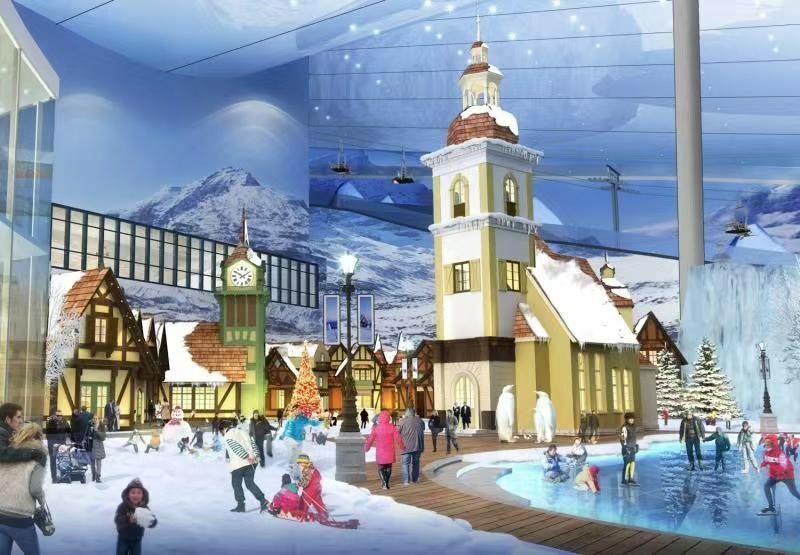 Besides skiing the indoor snow playground will offer around 30 snow entertainment activities such as snow slides, skate park, ice bumper cars, ski rotator and Santa sleigh, which doesn’t require any special sport skills, providing fun and recreation for the whole family. The S6 snowmaking system from TechnoAlpin is being used in the facility and the company says the system is ideal for indoor snow conditions. With the S6 system, a new layer of snow can be created daily, ensuring optimum snow conditions even for large numbers of visitors.